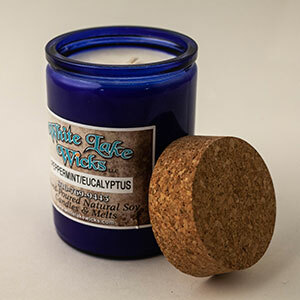 White Lake Wicks candles are made of 100% natural soy wax with no dyes added. Our soy wax will burn cleaner, last longer, and burn more evenly. No more black candle jars!! All our candles and melts are hand-poured using the best fragrances available in small batches. No dyes or additives are ever used, so blemishes and discoloration is normal. This however, will not alter the burning or scent of your candle or melt. Did you know soy candles have a memory? When you light your new soy candle for the first time, you should burn your soy candle until you have a FULL melt pool. This will establish its memory. If your candle is not given its proper memory burn, it will cause your soy candle to burn in a tunnel down the center, which causes wasted product and a poor scent throw. WHOLESALE: please call for information and pricing. Soy candles are non-toxic and will burn cleaner and last longer than traditional petroleum paraffin candles. Soy wax candles burn cooler than paraffin candles and a lower temperatures. This allows soy candles to retain their scent for the life of the candle. Soy candles lasts much longer than traditional paraffin candles. Soy was is made from soybeans and is biodegradable and water-soluble. Soy wax is a natural product-- -made from soybeans, which burns cooler than paraffin candles. Soy wax produces little to no soot, which means your jars, walls, ceilings will not turn black. Soy candles are also better for people with asthma or allergies. Candles made with 100% soy wax do not release the petroleum-based pollutants that paraffin candles do. This means cleaner air for you, your family, and even your pets. Soybeans are grown by farmers in the United States, which help support our economy. How long do candles burn? Why is all the wax white in color? We opt to not color our wax due to it being 100% soy. This prevents smoke and weakening of fragrances. What is best way to burn candles? First burn is the most important. Burn for about 45 minutes to allow a full puddle to form at top of candle. Never burn candle longer than 3 hours at a time before cooling down. What causes a candle to tunnel? Burning candle too long at a time it will get too hot.